Your wisdom teeth are the last molars at the back of your jaw. They normally erupt between the ages of eighteen and twenty-two. 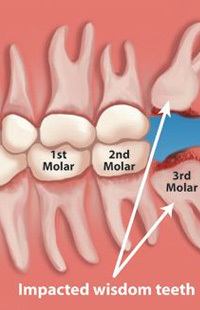 However, sometimes when these third molars do not get enough space, they get impacted or trapped. Impacted wisdom teeth can cause pain, bad breath, swelling, bleeding gums, headaches, infection, as well as injury. Sometimes, however, the impact may not show any symptoms but can become extremely hard to clean and consequentially more susceptible to decay. 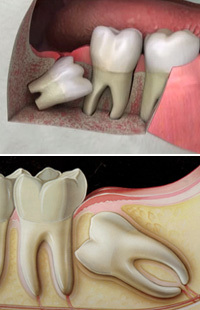 Surgery is by far the only solution for impacted wisdom teeth. Dr. Elnadi and his team of experts have extensive training in wisdom tooth extraction in Baltimore Md. They are capable of handling the most complex of cases with ease. Moreover, to make surgery a pleasant experience, the staff is trained in using anesthesia depending on the complexity of the extraction and the patient’s level of comfort. How do we perform the surgery? Once your wisdom tooth surgery in Baltimore Md has been performed, our dentists will provide you with a detailed list of instructions on how to carry on with your daily routine. Our advice may vary depending on the degree of your surgery. Moreover, we will also ask you to come back for regular checkups to make sure there is no damage to the mouth. 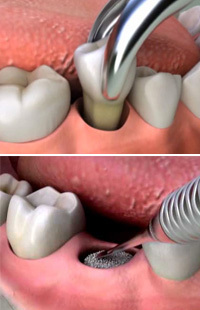 Interested in learning more about wisdom tooth extraction cost in Baltimore MD? Contact us today at 410-999-1111 to schedule a consultation!